After much consultation with my team and advisors I have chosen to end my relationship with Superstition Springs Golf Club in Mesa, and will be moving my formal base of operations to Papago Golf Course in Phoenix effective immediately. This is no reflection on the people or the facilities at Superstition Springs. Over the past decade I have come to know every inch of its driving range, chipping area, and putting green. I have met some very nice people there and have grown particularly fond of that hitting space on the far left side (adjacent to Alex Black‘s reserved practice area) with the moguls to the left and the 100-yard marker (which has never spent a day 100 yards out) smack-dab in the middle of my own little fairway. I will remember fondly the shady area on the west side of the practice green – especially on those blazing hot days of June and July when I’m doing my final Goodboys prep. The putting green was always a good challenge. And the course itself? Well, let me just say I won’t miss the fourteenth and seventeenth holes with all that water; only once in all the times I’ve played there have I ever been able to bogey either of them. It’s an early monsoon-like day in the Valley of the Sun. Even though it’s before noon on this Sunday, the sky is already a sizzling electric blue and thunderheads are building over the Superstition mountains to the east. The driving range at Superstition Springs G.C is nearly deserted – it’s just me in my old familiar spot at the far left-hand end of the range (right next to Alex Black’s pristine instructional area) and another guy down at the other end. My exposed areas are lathered in SPF 50, I’ve got a wide-brimmed hat, and two big bottles of Gatorade blue in the tiny amount of shade created by my golf bag to keep me company. Almost seven weeks from this very moment in time the 2015 Goodboys Invitational will be wrapping up. Seven weeks from tomorrow I’ll play one final post-Goodboys round with a small group of Goodboys at TPC River Highlands in Connecticut, and that will be pretty much it for 2015. I’m ready to go to work. Before I tip my bucket of balls over and reach into my bag to put on my glove I take a minute to drink in the surroundings (not to mention my Gatorade). Nothing has changed, and I’m back home where I want – and need – to be. As much of a tradition the Goodboys Invitational is in July, so is the prep work I begin putting in come June at the Superstition Springs driving range. Who knows what on God’s green earth I was thinking back in January when I said I was going to leave “The Springs” for greener pastures. Maybe it’s just the cowboy in me that never seems satisfied with good enough. Maybe just like everyone else I found out that the grass is not necessarily greener on the other side, or that no matter where you go you always carry your baggage with you. But after four months in golf limbo, I’d finally realized that me and Alex Black and Superstition Springs are the golf equivalent of grapefruit juice and Hemingwway daiquiris – you can’t have one without the other. So here I am, fresh off my lesson with Alex, with a large and small bucket to occupy my time this Sunday morning. The goals are simple: don’t stand too close to the ball, don’t play the ball too forward in my stance with any club, take a divot with my irons, and, with any ball I tee up, position the markings in the direction I want to hit it before I place my club-face behind it and take my stance at address. My session is very typical of Springs past: good stretches and not-so good stretches. I battled through an attack of the shanks that appeared out of nowhere while trying to hit 75-yard sand wedges (of all things) and finished on a high note. More than anything else, by following Alex’s advice of positioning my ball and not standing so close at address I hit my driver better than I have all year. And just as importantly, afterwards at the putting green I found my short game come back like an old familiar friend by not standing so close to the ball and taking the club back on a slightly flatter place. All told, being back at “The Springs” has me in a much better frame of mind as I prepare for this year’s Goodboys weekend. The prodigal son has returned, and no one seems to care one way or the other. I’ve got a good foundation in place; the only thing is to see if I can keep things moving forward and positively as the weeks count down. It’s good to be back. It’s good to be home. There are all kinds of things I could be doing on a late May Friday in the Valley of the Sun: working (now there’s a concept! ), dodging bullets while sketching Mohammad cartoons out in front of a Islamic temple, and working on my Tiki bar roof are just a few options I can think of. Me, I’m at the far end of the Superstition Springs Golf Club driving range in a tiny little shadowed area in 100-degree heat listening to feedback from my old swing coach Alex Black, who has just watched me hit a half-dozen 7-irons – a couple good, the others not so good. The 7-iron wasn’t my choice of club – I was only there because my inability to hit anything but dead-pull yanks and duck hooks off the tee with my driver had driven me to the point of despair. Which is exactly what the obedient student did. Then the world stood still for a moment. We watched a couple of players hit their balls from the left side of the range back into play on the 9th hole. A mother and her baby foo-foo bird dropped in front of us, then took off into the phosphorescent blue sky. The earth was quiet, the air still, not even a whisper of breeze. I suddenly knew where he was going. I had a flashback from our last session, even though it was two years ago. He grabs my driver and has me tee up a ball. Before I even begin to swing he stops me. “Not to hit it into the woods or the water”, I reply, knowing that these are very negative thoughts to have. But hey, I didn’t get to be a 27-handicap for no reason. The dutiful student does what he is told, and I’m getting ready to swing when he stops me again. “You’re standing too close to the ball. Step back. I move back a few inches. I step back another few inches. Now I’m so far back that I feel as if my arms are almost straight out. My drive hurtles left in long, sizzling arc. It’s a serious smash, dead center, with a high, lovely arc. I then proceed to try the same deliberate set-up at address – the placing of the ball just-so on the tee, the club-face placed behind the ball, the squaring at address with the ball not too forward, for a dozen swings. Some are good (actually awesome), some not so (I actually whiffed on one). And when the dread snap-hook shows up I can feel that I never shifted my weight properly. Now it’s just a matter of more reps and getting comfortable with what I’ve learned. After Alex leaves I hit a small bucket of balls – with mixed results – but I know where he is coming from. He’s a wonderful teacher and I’m feeling more positive about these next seven weeks than I ever thought possible. I can’t wait to hit the range and really get down to work to solidify the changes he has recommended. I hit a few chips around the putting green and he was exactly right – not standing so close to the ball I was able to take a little more flatter swing and felt a little more like my old self. Who knows what the future will hold and if what Alex said will take in this bird brain of mine. But the time was well worth spent. Now what did I do with the paper and pencils I had? I have some Prophet Mohammad cartoons to draw. The late Gabriel Gracia Marquez was one of my all-time favorite authors, one of the most gifted authors of his time. In my mind, he was up there with Thomas Merton and Henri Nouwen – someone whom you could pick up one of his works and know you wouldn’t go away disappointed. Sure, he was probably a Marxist by nature, but his prose was seldom equaled, and whether it was on a lounge chair on a cruise ship or soaking my bod in a bubble bath at home, whenever I felt like escaping to another place (i.e., Latin America) and simply enjoying the gift of writing for what it is, his works always took me away and brought me pleasure. For the preamble of the Goodboys newsletter this year, I thought I would try and write something in the spirit of Gabriel Garcia Marquez. Here, then, is the preamble to my first novella (planned for the fall of this year), “A Goodboy in His Himalayan Decrepitude”. It tells the story of Goodboy Ron “Cubby” Myerow, who ends up the lone remaining Goodboy following a time of American evolution and revolution where the liberal intelligentsia has triumphed and, in a post-Hillary Clinton presidency, put all Goodboys they could find to death. “…And it occurred to him in those later years, when he could still vaguely recall his time as a Goodboy, before the ravages of time and space would rob him of those memories forever, that it had all seemed akin to a dream, that of doors opening and doors closing, much in the way the dense jungle gives way to the open sea and in the abandonment of her clothing a mistress submits to her lover. The bricks of the monastery floor felt cool to his feet in the gray dampness of the Tibetan morning, easing the fever that raged in his head. He longed for an orange, yet found only almonds in the kitchen. Perhaps it was the fever that brought back so clearly in his mind the way it had all ended: the smell of lilac, the Elizabeth Montgomery statue, the final ceremonial tossing of that damned Spielberg Memorial Trophy into Salem harbor. Before the Goodboys he had been Ron, once a Goodboys (always a Goodboy?) he had been Cubby, now in his dharma he was Drokmi Lotsawa. ‘Things have a life of their own’, he recalled “Vegas” Clark saying before his execution. ‘And this thing is horseshit.’ A gong echoed across the fog-shrouded Himalayas. He heaved a heavy sigh and returned to his bed. I await an interested publisher. The official 2015 Goodboys Invitational newsletter is done, and we’re seven weeks away from what is known in Goodboys circles as “Christmas Eve” – the night before the Goodboys gather for Goodboys Invitational weekend. This year is pretty special: it’s the 25th year the Goodboys have gotten together, and there is bound to be lots of fun and surprises. You don’t go 25 years and not figure out a way to celebrate it in a special way, do you? I wish I could say I was ready for the 2015 festivities, but, truth be told, my tee game is in shambles. They say the first step towards recovery is recognition and acceptance that you have a problem, and the fact is, my tee game has never been worse. Thanks to Hunter Mahan and Brady Riggs I’m actually hitting my irons pretty damned well, but what good is that if you’re lying three with yet another lost ball in the woods? What is most sobering is the fact that the courses the Goodboys are playing this year: Waverly Oaks, The Pinehills, and Crosswinds, comprise the toughest courses the Goodboys have ever played in their 25-year history. Each of these courses put a premium on driving accuracy, and stray tee shots oftentimes have to contend with woods and side-hill lies and declivities. I should know – I shot a buck 22 at Crosswinds a couple of weeks ago, only to be told its the easiest of the three courses! And don’t get me started on my short game – can you say, Tiger Woods at Torrey Pines this past February? The short game I think I can ultimately work out with practice, but my tee game has become intolerable. Hence, the call has gone out to my former swing coach Alex Black. I don’t know if a quick fix is possible at this point, but if it’s not yours truly is in a world of hurt heading into the 25th Goodboys Invitational. May you all find the rest in God’s love and peace that you never were able to achieve in life. You’re all far better and more courageous people than I could ever hope to be. 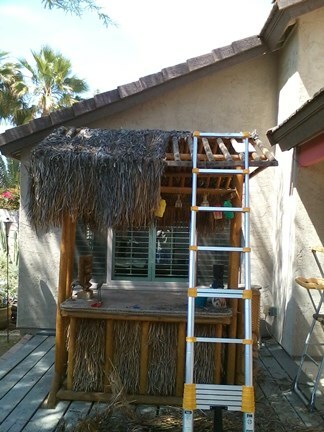 …for this year is the Tiki Bar roof. We bought the Tiki Bar nearly ten years ago and it has done its thing. But last year I noticed the roof was starting to look a little ratty and saggy as a result of the relentless Arizona heat and sun, so it was decided 2015 was going to be the year to replace it. 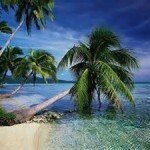 The roof is made of what they call Tahitian thatch, and the final material is manufactured down in Mexico. 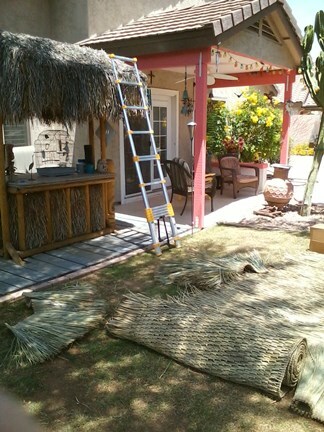 It’s not cheap – the replacement material cost around $500, but the alternative is to have a monsoon storm blow in here with hail and I’ll have thatch strewn all over the place and a window to the skies. The material came a couple of weeks ago but the pressure-cooker around here and a trip back to Massachusetts prevented me from getting started earlier. I was fortunate – any other year the temps would already be over 100 but the El Nino has made this a cooler and wetter spring for the Valley of the Sun. You can see the material laying on the ground and how fresh it looks compared to the existing roof. 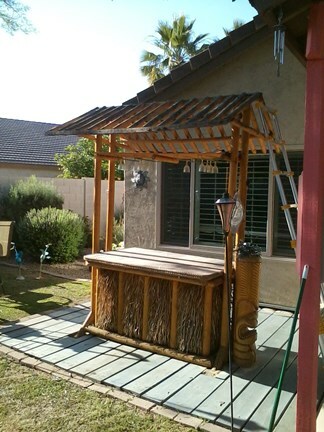 In reality, the Tiki bar roof was nothing more than a bunch of thatch sections stapled into the wood, and once you started prying the staples out of the wood the old material either disintegrated or could be easily pealed off. 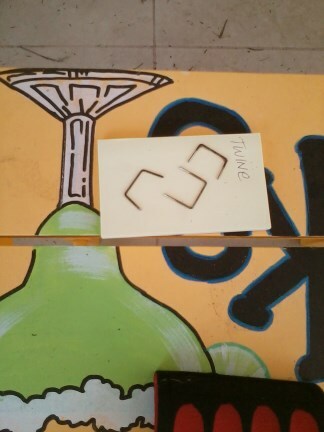 Before I did so, however, I made very careful drawings and measurements of the size and placement of all the sections. After all, you only really know how to put something together after taking it off. It was a messy job with all the old thatch literally falling apart in my hands. The wood underneath is not in the best of shape, so before I go replacing the thatch roof I’m going to paint it with preservative and remove all the old staples, which are not insignificant in size. I think I’m going to need to rent a compressed-air staple gun from The Home Depot. Now that’s what I call staples! At the end of the day, after all the mess was swept up and tossed into large plastic bags I’ve got a roof shell and a plan to layer the thatch a whole lot better than the way it was done at the factory. With all the other stuff going on around me it was nice to simply have an afternoon by myself to do physical work and put in place a solution that will be better, and I hope last longer, than what was originally bought. It’s like every other project I’ve undertaken over the past few years – you think you can get it done over a weekend but you get started and then find out there’s a whole lot more work involved than originally thought. I’m sure if I wanted to I could get back up on the ladder with my reliable right-hand man / sister-in-law Tammy and put the roof back on, but I want to take care of my investment as much a possible, so you either do it right or don’t do it at all. I know this collection is not going to be to everyone’s taste, but there’s no question it’s the most esoteric – one look at the song titles will tell you that. 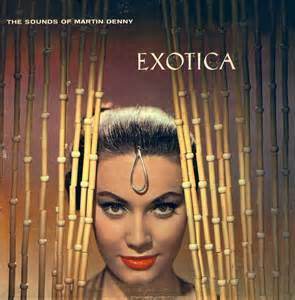 I won’t bother to go into the Exotica genre – I wrote about it at length here – but suffice to say, if you wanted to check out any of these artists on YouTube I think you’ll find it all pretty cool. Sometimes exotic, sometimes hypnotic, sometimes dreamy, always unique artists seeking to sketch an image into your mind of places long ago and far away through the transcendental power of music and imagination. 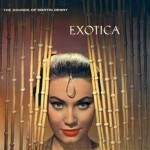 That’s Exotica. And I’m pleased to say it looks like one of my favorite Exotica artists, the Tikiyaki Orchestra, has a new release planned for this summer. If it’s truly only going to be made available on LP that would be really exotic. I’d have to see if I can drum up a turntable! 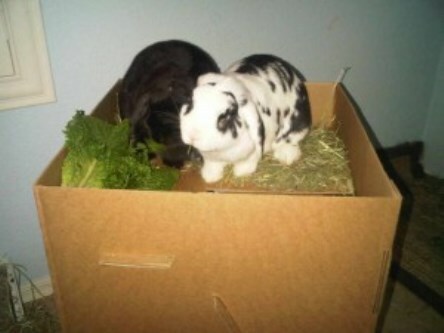 Kind of a tough weekend as this past Saturday we had the remaining member of the “Beastie Boys”, my sister-in-law’s rabbit Floppy (he’s the one on the right), put down. He had taken ill earlier in the week and had been left disabled and blind, so we did the right thing for him. While Tam had named him Floppy, he had come to known as Sherman because he had a very dominating personality, sort of like a Sherman tank. Floppy was an awesome rabbit. While his departed mate Cookie (the one on the left) was quiet, yet mischievous, Floppy hid nothing – he was what he was and he glorified in it. He hated having to do his business in litter, to the point where he’d physically scoop it out of the box. And do it over and over again to the point of monotony. While he loved Tam’s attention he really couldn’t be bothered with the attentions or affections of anyone else. After Cookie left us he enjoyed the company of Tam’s other rabbit Butterscotch, but I think he really saw his role in the world as making himself comfortable and happy first and foremost. I wouldn’t call him affectionate. I wouldn’t call him unaffectionate. He was just Sherm. He loved to eat. He loved to throw litter around. And more than anything else I think he loved knowing that Tam adored him. Floppy and Cookie were with Tam during the toughest times in her life. When everything else seemed to be falling apart around her, the “Beastie Boys” were a constant source of joy and affection. When I was called upon to rescue her from her situation in Florida, we didn’t leave until the Beastie Boys were snuck out while her a$$hole ex-husband’s back was turned. And all the way on that drive from Florida to Arizona the Beastie Boys sucked it up. Because they knew Tam was counting on them to. Rest in peace, Floppy. You were a great rabbit – truly one of a kind. You were loved and your owner misses you dearly. 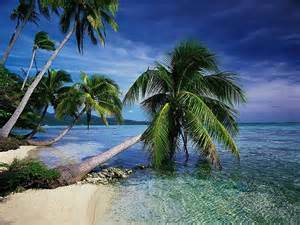 Of all my musical collections the one I’m most proud of is “Tropical Breezes”. The concept actually came from a Dish Network channel we once had before we went to DirecTV – it was a combination of Jimmy Buffett’s more laid-back stuff combined with the kind of steel-drum music you’d hear on board a cruise ship, but my collection gradually expanded into all kinds of Latin, classic Cuban, and Caribbean-flavored music spanning artists from Jimmy Buffett to Herb Alpert to Buena Vista Social Club to Frank Sinatra to Texas Tornados to Sergio Mendes to Ibrahim Ferrer to Bob Marley to Kenny Chesney to Cachao to Harry Belafonte to Stan Getz and beyond, and in doing so I found where my musical soul lies. Every time I put it on shuffle there’s beautiful music and surprises beyond anything I originally conceived – the journey far eclipsed any intention I originally had, and my musical horizons expanded far beyond anything I could ever have imagined. The finest of all my collections, on a sunny or tropical-like rainy afternoon it simply can’t be beat. It’s soothing, it’s eclectic, and best of all, it seems to grow almost every week with new discoveries!